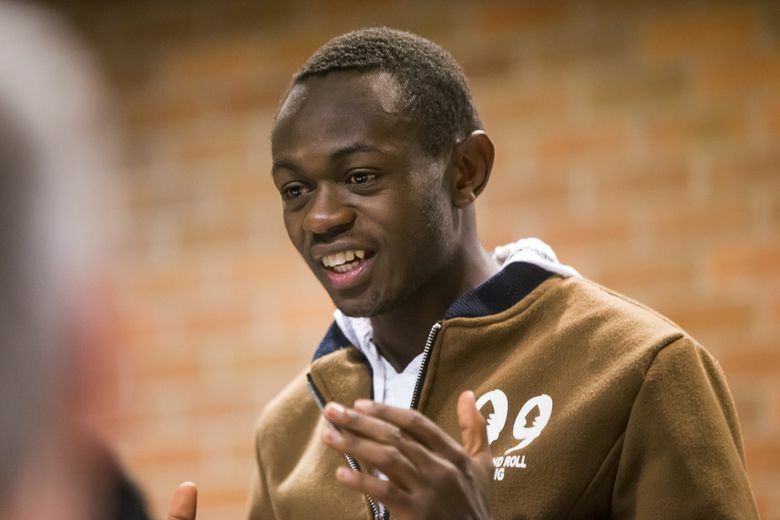 A young chess champion from the Uganda slums — whose against-the-odds story was featured in the book and movie “Queen of Katwe” — came to Kirkland to study at Northwest University. A friend arrived with her, giving the small school dreams of becoming a chess powerhouse. 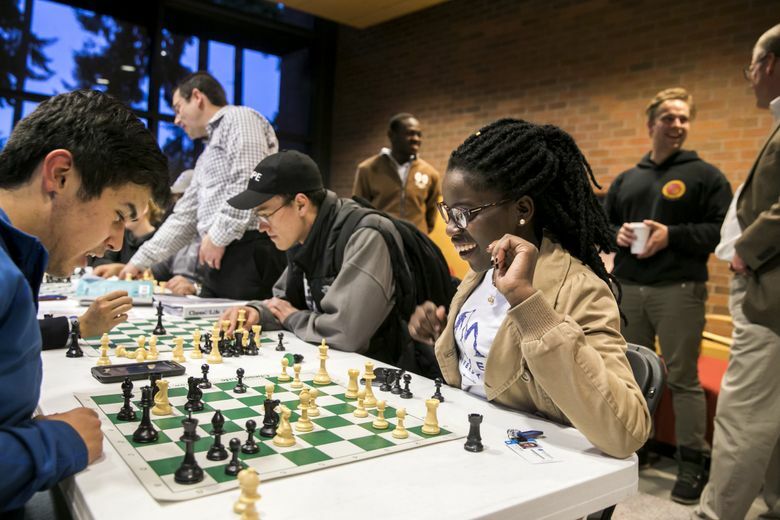 In a fireside room on Northwest University’s Kirkland campus, Phiona Mutesi stood up and accepted a title she was a little ambivalent about: president of the school’s just-formed chess club. She had another title too, a grander one, given to her by a book and movie about her life. The Queen of Katwe, she was called, due to her transformation from a homeless kid in Katwe, a Ugandan slum, to an international chess champion. 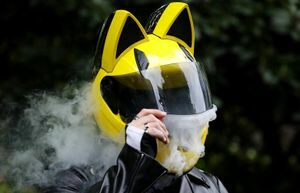 But the 21-year-old freshman is not the type of person to call attention to a thing like that, and her fellow students are largely unaware of her fame. Meet Ugandan chess players featured in movie "Queen of Katwe"
Interested in meeting and playing the Ugandan chess players featured in Disney's movie "Queen of Katwe?" Phiona Mutesi and Benjamin Mukumbya will be available Saturday, Oct. 14, from 1 p.m. to 4:30 p.m. at Northwest University in Kirkland. More details can be found here. She’s starting a new story now, of an American college student, and it suits her. “It’s a small school where I feel comfortable,” she said of Northwest, a Christian university of about 2,200 students. A week earlier, she was sitting outside in the late-afternoon sun near her dorm. Inside, students played foosball in a common room. Outside, they mingled on broad lawns. “The students are so free,” she said, noting their willingness to talk to anyone. She still aspired to the title of chess Grandmaster, several notches above her current ranking of Woman Candidate Master. But that could wait. Education, she said, could not. She planned to major in sociology and use her degree to work with kids in Uganda. 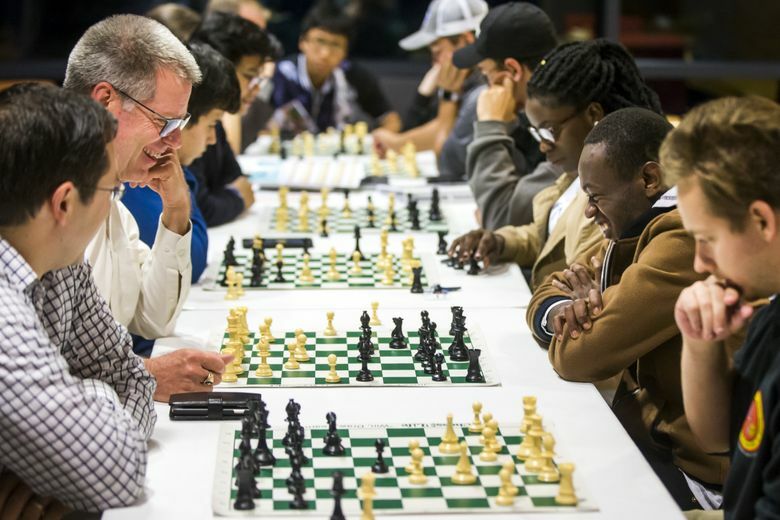 Mukumbya’s enthusiasm is matched by Northwest President Joseph Castleberry, whose new enrollees from Uganda have him dreaming of turning the university into a chess powerhouse. 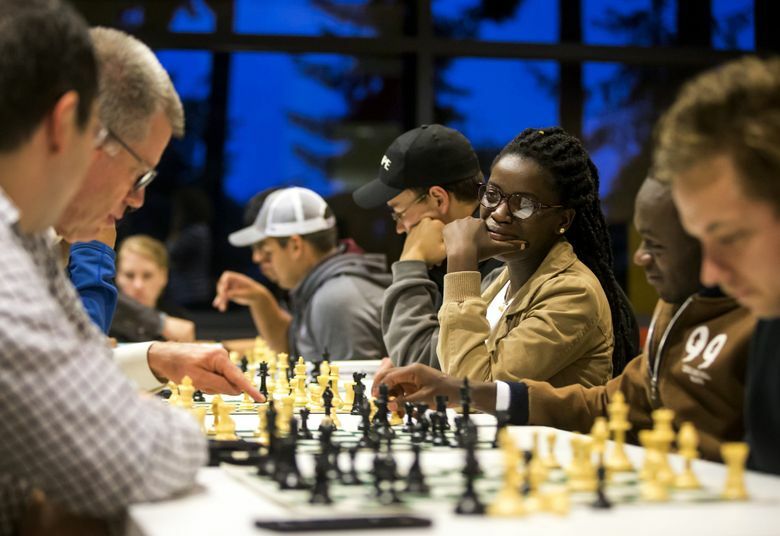 The Ugandan pair came to Kirkland because of a former Washington high-school chess champion named Elliott Neff. Now the head of Chess4Life, a Bellevue organization that runs chess clubs and classes for kids in eight states, Neff met Mutesi in 2014 when she was in Seattle visiting the Bill & Melinda Gates Foundation. “Queen of Katwe,” the book, had been out for a couple of years, turning Mutesi into an inspirational figure on several continents. She toured the U.S. many times to raise money and awareness for chess programs here and in Uganda. She can be reserved; her Ugandan coach, Robert Katende, told author Tim Crothers that she lacks confidence because of her background. 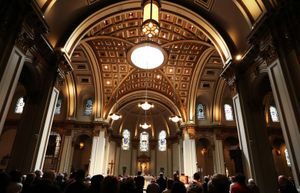 Her message gave people hope, and that in turn gave her courage, she said. She recounted what she’d say: “I grew up with a single mom. My dad died when I was young. We didn’t have food always. We didn’t have water. We had almost nothing. She took to the game because she was hungry. A chess club started by Katende, a missionary, was offering meals.To eat, she had to play. That’s how it was in Katwe, where she earned money by selling corn on streets roamed by gangs. Under Katende’s tutelage, Mutesi soon represented her country at a tournament in Sudan — which her team won, to much joy in Uganda, captured in the book and movie — and at international chess Olympiads. “Is there anything I can do to help?” Neff asked Katende, who traveled with Mutesi on her 2014 visit to Seattle. Neff could give Mutesi some lessons, Katende suggested. “We would go to Denny’s or wherever,” Neff recalled. After Mutesi went home, they continued the lessons via Skype. Eventually, he went to Uganda to help her train for the 2016 Olympiad in Azerbaijan. While there, Neff met Mukumbya, another member of Katende’s chess club who played with Mutesi as she prepared for the competition. Impressed with his potential, Neff invited Mukumbya to Bellevue to study with Chess4Life. He came in January and stayed for five months. Meanwhile, Neff approached Northwest University on Mutesi’s behalf. Would the school be interested in having the Queen of Katwe as a student? “I was delighted to step up,” said Castleberry, recalling how he had wept through the movie. He offered her a generous scholarship. She came to visit the school last spring — when Castleberry, to everyone’s surprise, offered Mukumbya a scholarship as well. It was a spur-of-the-moment decision, Castleberry said. Mukumbya had accompanied Mutesi to the school, and they were all in the university president’s office. And so Castleberry gave him one. It was Mukumbya’s idea to start a chess club at Northwest. 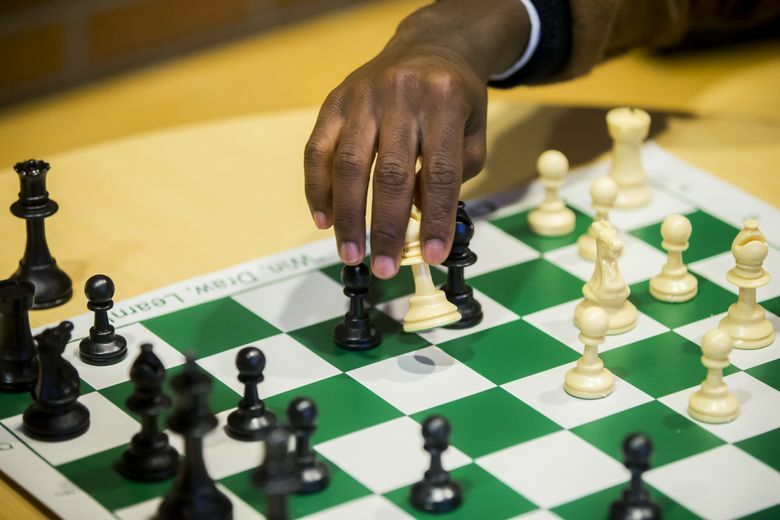 The 19-year-old had brought his chess board from Uganda, determined to keep playing even as he took demanding pre-med classes in hopes of becoming a neurosurgeon. Settling into his dorm room, he unpacked the chess board along with his other things, then went out. When he returned, roommate Walter Borbridge, a once-competitive player from Alaska, had started a game. It was raining hard on the night of the chess club’s inaugural meeting, and there were a number of other things happening on campus, so Mukumbya wasn’t sure how many people would turn out. But Borbridge came, as did a Navy veteran who played competitive chess in high school, and a number of people who had barely played at all. Mukumbya’s optimism was unshakable. In just two months, he told the group, he expected the club to produce a team that could compete in intercollegiate competitions. Castleberry — who showed up as well, bearing a couple alabaster chess pieces once owned by his dad — was all in. 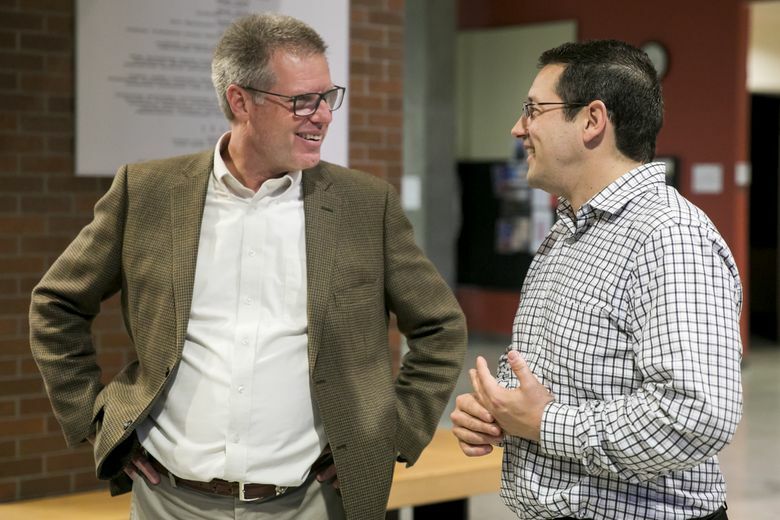 That very day, he had talked to Neff, the new club’s coach, about sending a Northwest team to the Pan-American Intercollegiate Team Chess Championship. Drawing players from North and South America, it will be held late this year in Ohio. Castleberry intends to go himself. Chatting after the meeting, he talked about recruiting more players from Katende’s club in Uganda. Mutesi’s role in this drama is undetermined. Club members will have to compete for a spot on the competitive team, and she wasn’t counting on making it. She was there, and that seemed enough. Chess had taught her a lot about life — how to use her aggression mentally, how to strategize and how to make the best use of her resources — and changed it at the same time. She was ready to pass some wisdom on. There was no reason to fear chess, she told the group.